The plank is ready for the vise and the plane work begins. 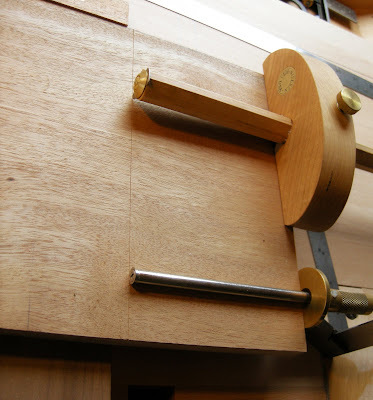 In this next shot you can see the small level I use when I place any work piece in my shoulder vise; a quick and easy little trick to insure you’re always working level in the vise. I paid pennies for it a while back and it now travels with me, one of my ‘hand tool essentials’ in the Cabinetmakers Tool chest. My 5 1/2 Jack will scrape away the scars left behind from the hand saw and soon enough I’m onto the opposite edge. Repeating these steps like a familiar dance, a perfect world would see my toolbox being infinite and I’d be able to travel with my large jointing plane and all of my hand tools…but the reality is we have two young children, a dog and a not so large SUV. My jointing plane stayed behind so the 5 1/2 is the big gun today. 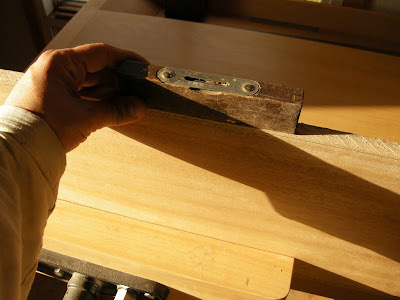 I don’t mind using this plane for edging boards. 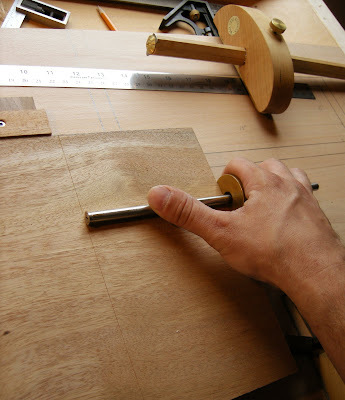 Remember, I’m not jointing here but dressing the edges and the Jack plane is ideal for this scale of work. Now with the two edges dressed I’ll move onto an end, to square it up and continue along the process. Again I need to laugh and take two steps back before I can move on because my shooting board is with my saw bench and all of the stink I left behind in Toronto. A quick browse through the off cut isle and I get to work on a simple shooting board. 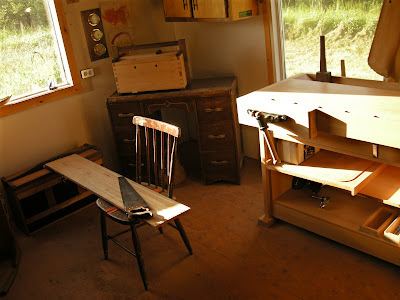 No side ramps or fancy bells or whistles but a bare minimum bench hook that will do the job well. David Charlesworth uses this simplified jig and who really in their right mind would argue with him? 20 minutes at best and I’m taking practice shavings. 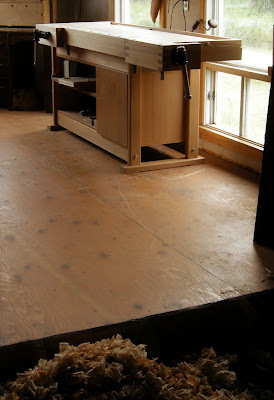 The surface is 3/4″ walnut plywood; I didn’t change the size it’s the size it was left at and it’ll work out fine. The hook on the front underside is also plywood with an off cut of hardwood for the fence. 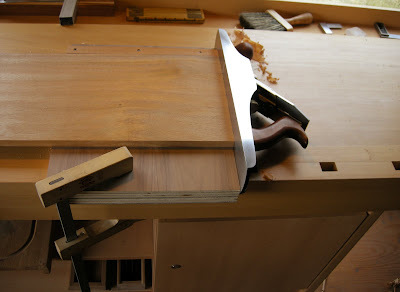 With the new shooting board working and safely tucked away below I begin the process of flattening my bench. Not too much grief over-all but the tail vise is pretty messed up. I use this vise the very least in my shop, instead relying on simple bench stops for hand planning and my front shoulder vise for 90% of the clamping load. 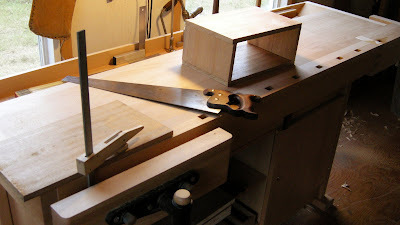 Complete and clean with some shavings for the garden… Now then, with a side step or two I can get back to work on the little box design I’m seeing in my mind, a rough sketch on an off cut and we’re ready to start dimensioning the components. The bench top is flat and the shooting board is working. I’ll lay-out the lengths for the four sides to begin. 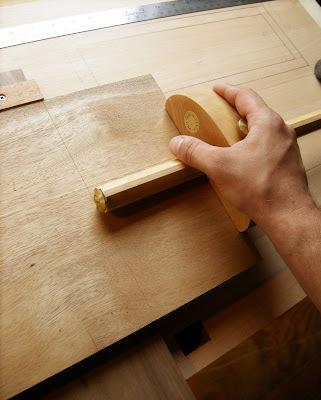 A marking gauge or panel gauge is the tool for the job and I’ll show you why I prefer using the panel gauge over the marking gauge for any measurements over a few inches. This is the Lie-Nielsen panel gauge and a Tite-Mark by Glen Drake, probably the most used tool in my shop and the nicest marking gauge I’ve ever used. 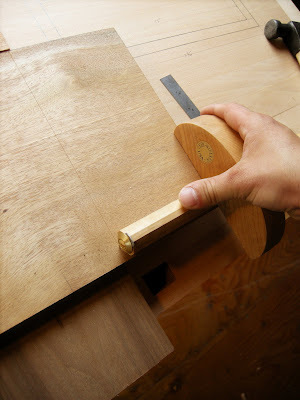 Perfect for dovetails or any joinery under 3″. Once you get past that 3″ mark I find the round plate area of the gauge a little small to hold with any accuracy while marking a line like the example given here. Before I had a panel gauge I’d simply measure with a rule and stike the line with a knife but I find I get better results with a gauge referenced off of the freshly squared end off of the shooting board. The panel gauge on the other hand with its large surface to reference is both comfortable and accurate. With the panel gauge set and the cutting knife adjusted to the proper depth I’ll begin the line making sure to keep my hand pressure on the front leading edge. I travel across the board transfering my grip and roll my hand position over to the back side of the gauge as I finish off the line. This movement feels natural and keeps the fence tight to the work edge. The next three shots will show the positions. First line cut crisp and square I’ll get out my cross-cut panel saw and working off of the end of my work bench get the pieces ready for joinery. 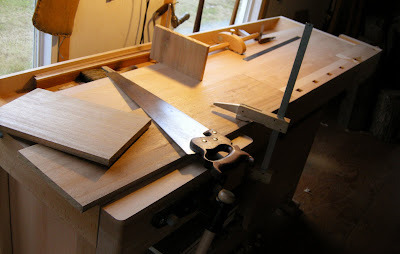 A top and a bottom with two sides, a few minutes to complete it’s back to the Jack plane to surface and shoot making two pairs as close as I possibly can. A simple box, four sides-only a few minutes right? 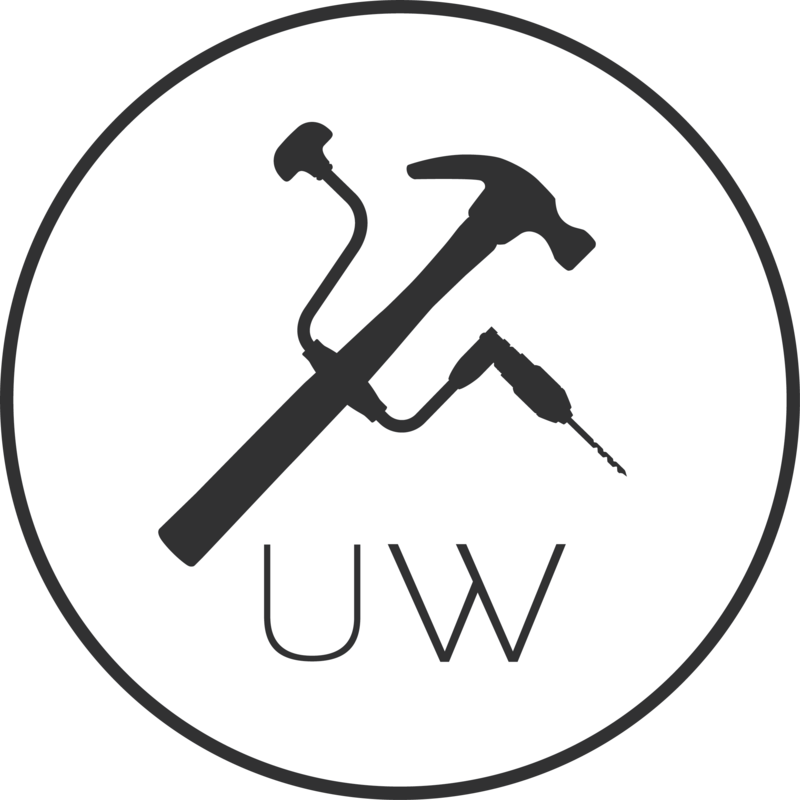 You can see that in a hand tool shop that sometimes the ‘getting started and setting up’ stages can take a little longer but we won’t need to do this all the time. 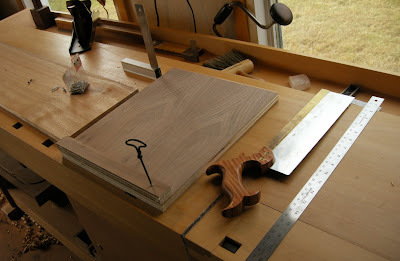 So the bench top is flat and I’ve made a new shooting board (and a bench hook but I didn’t take any shots…it’s pretty much the same as the shooting board with a thinner fence stock) I can move ahead with the project and work comfortably and efficiently. A simple morning set-up and the ‘Unplugged Summer Shop’ is ready to go…or is it? 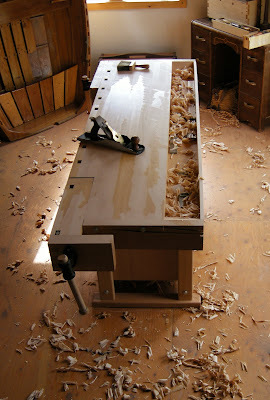 I’m beginning to plane the surfaces but before I do I’ll need to make a bench stop. Another small delay in this mornings routine but the journey is the destination and this is the joy of working wood with hand tools. More to come… Cheers! Happy that you are back on the blog! what a wonderfull narrative is this one! 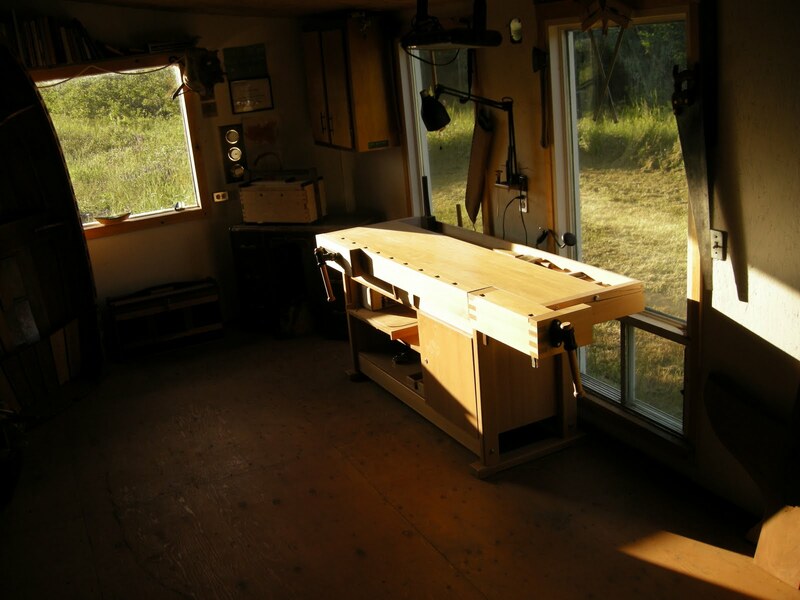 what resonated most with me about your post has to do with how you took the time to set up your shop a bit before going into the dovetail box…you can't make something well (and certainly can't enjoy the process of making something well) until you've taken some time to set the bench flat, and kit out the shooting board…it's those meaningful and deliberate steps I take before setting out on the creative process that makes things go so much better. 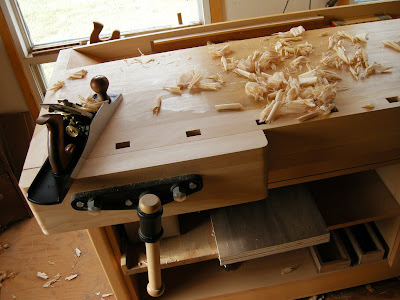 for me, it's about taking that 10 or so minutes before "beginning" to freshen up the edges on the chisels and planes…that probably goes without saying tho!